Rabbits feed on a wide range of plants in the garden. They may just nibble away at the top of the growth – or cause considerably more damage, killing small plants. Rabbits are common garden visitors in rural areas, although they are also becoming more common in urban areas too. Although rabbits mainly feed from dusk to dawn, they can be active – and feed – throughout the day. Rabbits are prolific breeders – hence the common saying, breed like rabbits! Although the main breeding season is from January to July, litters of young can be produced all year. Female rabbits produce two to five litters a year with an average litter containing three to six young. They can become pregnant again just one day after giving birth. Rabbits often live together in quite substantial colonies, known as warrens, which consist of several interconnecting burrows. These usually occur in areas with dense plant cover. But isolated burrows do occur, and some rabbits even spend all their life above ground. Rabbits damage and eat a wide range of ornamental, vegetable and fruit plants. Shoots of herbaceous perennials, annuals, bedding plants and vegetables are grazed down to ground level. Foliage and young shoots of trees and shrubs can be grazed up to a height of around 50-55cm (20-22in) when rabbits stand on their hind legs. Bark of trees and shrubs may be gnawed away from the trunk. This is especially common in winter when other food sources are scarce or unavailable. They also dig holes in flower beds and lawns – often extensive if they are looking to create a nest or burrow or warren. Rabbits may also gnaw on plastic items, including hosepipes, cables and plastic netting. 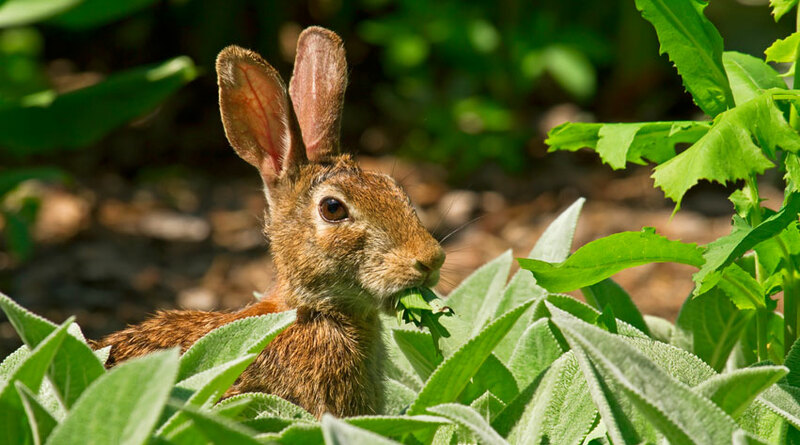 In many circumstances, you may have to tolerate rabbit damage – or change gardening activities accordingly. Even if you manage to banish one lot of rabbits from your garden, more will probably move in to occupy the vacated territory! Some plants are more resistant or more tolerant than others, but even the young growth of these can be damaged, especially when other food sources are scarce or unavailable. You can cover and protect particularly susceptible plants individually with wire-mesh netting to prevent rabbits getting at them. Plastic netting will probably be ineffective, since rabbits can gnaw through plastic. Fruit and vegetables can be protected in a fruit cage; see prevention below. The bark of the main trunk of trees and shrubs can be protected with tree protectors or caging individual plants. Animal scaring devices are usually fairly ineffective, and will probably only provide short-term protection. Rabbits can be controlled by shooting, gassing or trapping, as long as this is done in a humane manner. But this may not be practical or feasible in gardens for safety and legal reasons. In which case, this is best carried out by a professional company. Scented and smelly animal repellents are available but are not usually totally effective – especially during wet weather – and, if they do work, only provide short-term protection. Spraying plants with deterrents that contain aluminium ammonium sulphate makes them bitter tasting, so reducing damage. These have to be applied regularly, especially in wet weather. One of the best methods of control is to prevent rabbits getting into the garden in the first place. Rabbit-proof fences of wire mesh should be at least 1.2m (4ft) high, and with 30-45cm (12-18in) buried in the ground; the bottom 15cm (6in) should be bent outwards to stop the rabbits tunnelling underneath. Where completely fencing the whole garden isn’t possible, it may be possible to protect smaller areas – the vegetable garden for instance. An electric fence may be a more practical and effective solution.